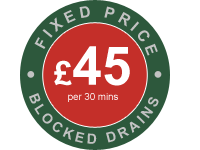 Drain jetting is extremely effective, and can be used on all types of drains and all types of obstructions. The water is so powerful that as well as clearing blockages caused by grease, fat or scale, it can also remove tree roots or any other matter that has become lodged in the drain. Most of our engineers carry a jetter on their van and can set it up in minutes. All of our engineers are fully committed to protecting and respecting your home and property. They are fully trained in the use of their high pressure water jetter and will set up a safety zone to operate it according to strict safety guidelines that are designed to protect you, your home and themselves. If the jetter can’t clear a blockage, it’s possible that the drain has collapsed. The cost of accessing and repairing the pipe may often be covered under your buildings insurance, and your engineer can explain how AlfaClear Drains can work directly with your insurance company to resolve your claim. We even carry out the work while your claim is processed, so that you don’t have to wait.